Tonight, against Icasa (from Juazeiro do Norte, state of Ceará), expectations are high for the debut of 32-year-old Sebastián Eguren. The Uruguayan defensive midfielder brought from Libertad/PAR was recently unveiled at Palmeiras receiving the #4 jersey, but a few days back grabbed the #5 as João Denoni temporary left for Oeste. Not only is Eguren raising expectations for being a quality player who holds a spot in the Uruguayan national team: most supporters are expecting him to replace Márcio Araújo in the starting eleven, a dedicated but unfortunately very limited professional with an incredible 224 games and counting in the Palmeiras jersey. Now, what to expect from Eguren? To help us draw the profile, German Ulli Pape – co-admin for Eguren fan pages on facebook and twitter – has contributed with the text below. Seba played for Spanish side Sporting Gijón for two seasons, then signed with Paraguayan Club Libertad after Sporting was relegated to the second division and let him go for free. At Libertad, Seba held a spot in the starting eleven for the rest of the semester and only got substituted once after taking a fierce elbow check in his cheek. He contributed two goals to the club’s march to winning the Clausura on December 12, guaranteeing Libertad a spot in the Copa Libertadores as well as participation in the Copa Sudamericana. The preseason for the 2013 Apertura started in January 2013. Following a special request from Libertad’s president, defensive midfielder Pablo “el Cholo” Guiñazú had joined the club and was regarded part of the “A-team”. Seba was under contract for 18 more months with Libertad, while his old club Nacional was in dire need of a defensive midfielder. However, Libertad’s asking price turned out to outmatch Nacional’s financial possibilities. Seba’s time on the pitch diminished. As of May, he never even made it to the bench. Despite of this, Uruguay’s national coach Óscar Tabárez called Seba up for the matches to come: a friendly against France, a WC qualifier against Venezuela, and the recently concluded Confederations Cup. 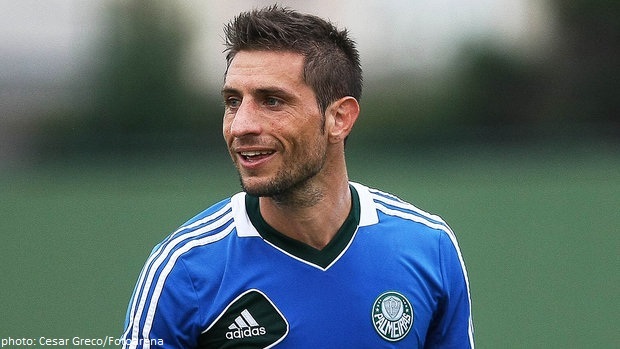 Simultaneously, rumours pointed towards Palmeiras as Seba’s new club, his fan community keeping their fingers crossed. So, what can be expected from Seba at Palmeiras? For Seba, team and fighting spirit come first. From him one can expect 100% professionalism: he won’t argue with the coach, he won’t miss training or be late. He will push the limits, always. Seba also stands up for his teammates and cares for their personal well-being, on and off the pitch. Seba’s natural place is in front of the defence line, where he can have a good overview, but he also scores the occasional goal, taking advantage of his stature. He doesn’t shy away from a discussion with the referee. He helps organize the game – the reasons why he’s one of the vice-captains of the Celeste. Palmeiras is Brazil and Brazil is famous for artistic football, players zigzagging between opponents, impressive free-kicks, you name it. Please don’t ask anything like this from Seba: he’s a defensive midfielder and he’s good at it and will give everything to do his job the best way possible – which is a lot.